So you bought a Meat Grinder. Now what? Now you can cut the game processing company out of the equation. Or buy the whole cow from your local farmer. And make sausages. And burgers. And jerky. All fresh, from scratch. But wait! 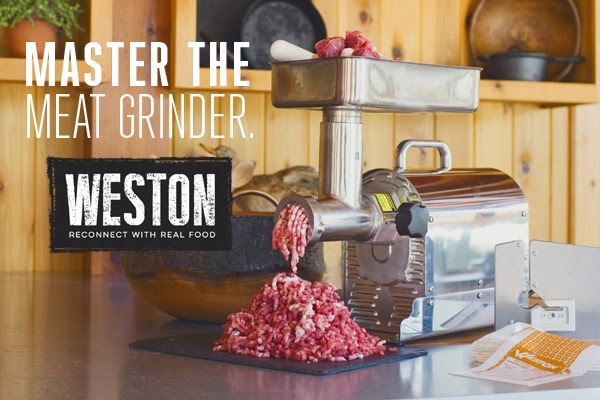 Before you go all in, there are some tips and tricks that you should know to ensure you keep that meat grinder working properly and that the ground meat pouring out of it is the best possible quality. We've got you covered. We put together 12 tips to help you master the meat grinder. ahead of time: plates, knife, head, auger, and tray. almost freezing— and try to touch it as little as possible. Your hands are radiating heat! 3. Include added fat content. Sometimes to achieve an 80/20 (our favorite way to go), 85/15, or 90/10 [etcetera] blend, you'll need some help from another source, as your particular cut of meat may be too lean. Purchase beef or pork fat from your local butcher and keep it frozen until you're ready to grind. If your fat gets warm, it will melt into the fat, rather than keeping its distinct state, and your ground meat texture will be ruined. 4. Do a first grind. Almost always, you'll need to grind your meat through a coarse plate before grinding it any finer. This is called a first grind. If you try to grind most meats any finer to begin with, you'll create a mushy texture, and likely jam up your grinder. 5. Use a combination of grinds. ...Especially if you'll be making sausage or other products that you want to bind tightly. We recommend leaving one-third coarse, grinding the rest through the medium plate, keeping one-third medium, and then grinding that remaining one-third finely. 6. No first grind for waterfowl. When you're grinding ducks, geese, and other waterfowl, grind all of it through the fine plate, right away - no need for a first grind. 7. Clean as you go. As soon as the meat begins to slow, or come out mushy, turn your grinder off and remove the sinew from the knife & buildup from the auger. Then, replace your newly cleaned auger, knife, and plate. The buildup will cause the meat to warm— and warm meat is never a good thing. 8. You CAN get all of the meat out. When meat completely stops flowing from the grinder, there is still likely a bit inside of the head. One of the best ways to get it out is to run a piece of bread through the grinder. The remaining meat will come out, and the ground bread that comes out behind it can just be discarded (it won't really hurt to add it to your ground meat either though). 9. Store the meat properly after grinding. Use Weston Ground Meat Bags with our Bag Neck Sealer to keep your ground meat not only safe, but as fresh as possible when storing in the freezer. Alternatively, you could use a Weston Vacuum Sealer. 10. Ready your grinder for future use. Disassemble and completely clean your grinder parts in hot, soapy water. Be sure to thoroughly dry the parts after. Silicone Spray and/or Sanitary Lubricant help to protect and lubricate the parts. 11. Don't forget the nooks and crannies. Use our Cleaning Brush Set to thoroughly clean the inside of the head and plates of the grinder. 12. Remember that grinder knives dull just like any other knife. Change Grinder Knives and Plates regularly, and be sure to purchase the same type of steel. Different steels vary in hardness, which can cause a harder knife to scrape metal from your plate into your food. A harder plate dulls your knife quickly. If you have any tips to add, or any questions about using a meat grinder, please let us know in the comments below! Great tips! I always partially freeze my meat but never thought to freeze my equipment too. Makes sense. I'm going to try that on the next deer we harvest. Thanks! Hi, great tips! Thank you for sharing. Exactly. The grinder knives dull just like any other knife. We should not forget to change them. Great tip using bread to get the rest of the meat out of the grinder. Awesome idea for my kitchen's tips list. Thank you very much for this useful post and looking for your future tips about kitchen! This is the official Weston® blog where we bring you brand news, product tips, and recipes for cooking with our products. ©2015 Weston Brands LLC. Picture Window theme. Powered by Blogger.